After weeks of insisting he would not run for Speaker, Wisconsin Republican Rep. Paul Ryan - according to those close to him - is now open to leading the fractured Republican conference, and seriously considering launching a bid for speaker of the House. But there's a caveat. And it's a big one. Ryan's confidants tell CBS News he will not horse trade with the House Freedom Caucus, a group of 40 or so deeply conservative members who have been demanding changes to House rules and other very specific promises from candidates for Speaker in exchange for their support. Ryan's confidants say he is not going to negotiate for a job he never sought, and that he has a record of conservative leadership that should be clear to every member of the GOP conference. 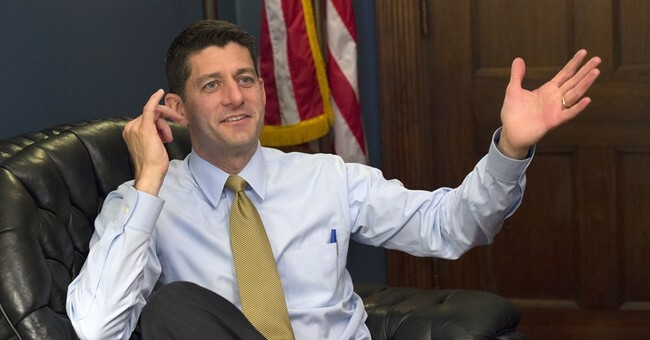 They say Ryan hasn't ruled out meeting with the House Freedom Caucus if asked, but "he's not going to go to the Freedom Caucus and say, 'I'll do this and this'...otherwise you've sold yourself to them from the very beginning, and set yourself up for failure" said someone with knowledge of his deliberations.' "He still really, really does not want to do this. He has his dream job. If he's Speaker, his whole career path changes. He's not going to make concessions to get a job he didn't want in the first place." Either members believe in his conservative leadership, or they don't - and if Ryan concludes that he's unlikely to get a near-unanimous vote of support from republicans, his allies say he is happy to stay exactly where he is as the chair of the House Ways and Means committee. If Ryan chooses not to run, House Republicans will be in an even bigger bind than they are in already. It's unlikely that any of the Republicans in the Speaker's race now - or any of the several who have signaled an interest in running if Ryan doesn't - have a better chance of getting 218 votes than he does. A source close to House Speaker John Boehner says that if Ryan bows out, there is a growing recognition that Boehner may have to postpone his plans to leave Congress, cancel the October 29th vote for Speaker and stick around until the end of the year as Republicans work out their leadership issues. Until now, Boehner's inner circle had insisted that he was extremely reluctant to extend his time in Congress, though Boehner has said he is committed to remaining in the role until a speaker is chosen. As I've stated previously, be careful what you wish for; toppling leaders in intraparty squabbles does not guarantee a more desirable outcome, especially absent a viable plan. Nevertheless, onetime admirers-turned-vocal critics have already emerged, citing elements of Ryan's voting record and his controversial allies as cause for suspicion and concern. Also, out of curiosity, how would this arrangement work, exactly? Republicans imploring Paul Ryan to become U.S. House speaker are dangling a pledge that he can skip the job’s frantic fundraising duties. But it’ll cost them upwards of $35 million per election cycle. That’s what outgoing Speaker John Boehner raised, through a grueling nights-and-weekends pace that had him trekking from Florida to Alaska and places in between throughout the 2014 campaign. And this year is no different, as Boehner already has traveled to more than 100 events, according to his fundraising operation...Some say the cost wouldn’t only be to the party. Ryan, 45, would find himself a weaker speaker if he didn’t put his star quality to work for lawmakers desperate for campaign cash...To ease Ryan’s concerns, party leaders are said to be considering a plan that would remove some of the fundraising responsibilities from the speaker’s office.